Colonel Ronald J. Perkins, United States Air Force, retired, was born during 1943 in Cleveland, Ohio and graduated from Chester-Franklin High School in 1961. He earned his Bachelor of Science degree in Education from Ohio State University in 1967 and then his Master of Science degree in Business Administration from Boston University in 1981. He is also a graduate of Squadron Officer’s School, Armed Forces Staff College, and the Air War College. Colonel Perkins was commissioned a Second Lieutenant through ROTC at Ohio State University. He received his pilot wings at Sheppard Air Force Base, Texas, in February 1969. Upon completion of undergraduate Pilot Training, Ron went through F-100 training at Luke Air Force Base, Arizona followed by duty tours at Tuy Hoa Air Base, Republic of Viet Nam and England Air Force Base, Louisiana. 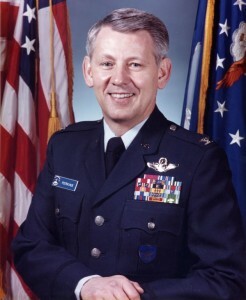 In 1970, Colonel Perkins was assigned to Mountain Home Air Force Base, Idaho, as a part of the initial cadre of instructors in the F-111F Ardvark. In June 1975, he was selected for the Navy Exchange Program flying the A-6 Intruder. He finished his Navy tour in November 1977, with 131 carrier landings and a WestPac cruise. Following his Navy assignment, Colonel Perkins attended the Armed Forces Staff College in Norfolk, Virginia. Upon completion, he was assigned to the Fifth Allied Tactical Air Force in Vicenza, Italy, where he was Assistant Chief of Special Operations and Plans. In July 1981, he was reassigned to Mountain Home AFB, Idaho, where he served tours as Operations Officer to the 389th TFTS, 391st TFS, and Det 2, F-111 USAF Fighter Weapons School, respectively. In May 1983, he assumed command of the prestigious F-111 Fighter Weapons School. Colonel Perkins went to the Air War College in 1985. After completion, he was assigned to the International Programs Directorate on the Air Staff in Washington D.C. As Chief of the Americas Division, he directed the formulation, implementation, and management of Security Assistance for 28 countries in Central America, South America, and the Caribbean. In 1988, he was selected for a Joint Duty assignment as the Deputy Commander Iceland Defense Force/Island Commander Iceland. After completing a three-year tour, in 1991 Colonel Perkins was assigned to the Air War College as the Director of Strategic Management Studies. One year later, he was assigned as the Director of the International Officer’s Program where he was responsible for officers and their families from 41 countries around the world. He welcomed, the first time ever, Russian and Eastern Block Air Force Officers to the USAF’s Air War College for senior officers. In 1994, Colonel Perkins was assigned as the Department Chair for Aerospace Studies at Arizona State University. As Professor of Aerospace Studies, he was responsible for the planning and execution of the Senior Air Force Reserve Officer’s Training Program. Colonel Perkins retired just shy of 30 years of service in OCT 1997. After retiring from the Air Force, he took a job as the Director of International Marketing & Sales for Royal Aviation in Mesa, Arizona. Then in February of 1999, he became the Senior Aerospace Science Instructor at Cactus High School, Glendale, Arizona. He worked there for 6 ½ years and retired fully in June of 2006. Colonel Perkins is a Command Pilot with 3050 hours of flying time; with 171 combat missions in Vietnam. His decorations include the Defense Superior Service Medal, Legion of Merit with one oak leaf cluster, Distinguished Flying Cross, Meritorious Service Medal, Air Medal with nine oak leaf clusters, and the Joint Service Commendation Medal. Colonel Perkins is married to the former Elizabeth Soulier of Mt. Gilead, Ohio. They have three daughters: Lisa, Lori, and Susan. They also have three grandsons and three granddaughters.